Students and faculty of California's Pitzer College voted Thursday to suspend the study abroad partnership with Israel's University of Haifa, but college president Melvin Oliver is declining to take any action on the program, calling it an "academic boycott of Israel." 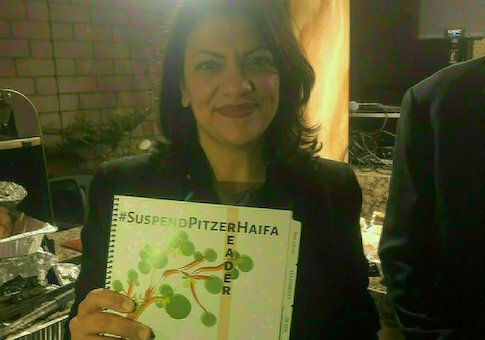 The anti-Israel proposal, backed by radical leftist groups and Democratic congresswoman Rashida Tlaib, won the support of the Pitzer College Council in a Thursday vote taken by both students and faculty. Oliver says the vote amounts only to a recommendation to the president and is declining to take it. Oliver made numerous arguments against the proposal in a Thursday message to the academic community, including that it was "prejudiced" against Israel, would "curtail academic freedom," and that it is not the school's role to take political positions. "Although some claim that this is not an academic boycott of Israel, I disagree," Oliver wrote. "The recommendation puts in place a form of academic boycott of Israel and, in the process, sets us on a path away from the free exchange of ideas, a direction which ultimately destroys the academy’s ability to fulfill our educational mission. I categorically oppose any form of academic boycott of any country." Oliver said the "prejudiced" action against Israel would cause irreparable harm to Pitzer's reputation. "By singling out Israel, the recommendation itself is prejudiced," he wrote. "The reputational harm to the College would be irreparable and as president of this institution, I cannot permit that to happen." Oliver argued suspending the program would be "directly counter to Pitzer's core value of intercultural understanding."